NARA — A special exhibition featuring a large number of precious Buddhist statues, sculptures, other works of art and archaeological artifacts dating back to the Hakuho period — from around 645 to 710 — is being held at the Nara National Museum in Nara. The exhibition, titled “Hakuho: The First Full Flowering of Buddhist Art in Japan,” celebrates the 120th anniversary of the museum and displays about 150 works, including many national treasures and important cultural properties. The event revisits the flourishing Hakuho culture of the period, which is represented by Buddhist statues with youthful freshness and adorable facial expressions. “Hakuho” is an unofficial period name often used in art history and archaeology. It covers a period of about 60 years from around 645, when the Taika Reforms took place, up to 710, when the capital was moved to Heijokyo in what is now Nara. Around that time, Fujiwarakyo was constructed as the first full-fledged capital, enacting the Taiho legal code and minting Fuhonsen coins. Thus, the Hakuho period produced a kind of state that led to the current Japan. Buddhism gained force during the period, and construction of Buddhist temples expanded from the capital to other parts of the country. According to the “Nihon Shoki,” the ancient chronicles of Japan, there were 46 temples nationwide in the year 624, but the number increased more than 10-fold, to 545, by the year 692. Many Buddhist statues were manufactured during the period. Among these statues, “Gakko Bosatsu Ryuzo” (Standing Gakko bosatsu) is one must-see at the exhibition. It is an attendant bodhisattva from among the Yakushi triad main statues at Kondo hall of Yakushiji temple in Nara. The statue is known for its well-balanced posture and resilient body, and is acclaimed as one of the masterpieces of Japanese sculpture history. 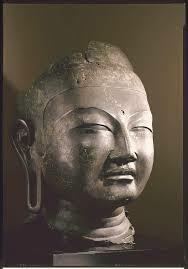 “Butto” (Head of a Buddha) at Kofukuji temple in Nara has an impressively dignified facial expression. It used to be the head of the main statue of the lecture hall at Yamadadera temple in Sakurai, Nara Prefecture. It is a representative work among Hakuho period Buddhist statues. “Amida Sanzon-zo” (Amida Triad) is thought to have been among the personal worship objects of Lady Tachibana, the mother of Empress Komyo. It is also believed that she worshiped the statue every day. It is a superb work made by highly skillful metalworkers and sculptors of the time. “Shaka Nyorai I-zo” (Seated Shaka nyorai) from Jindaiji temple in Chofu, Tokyo, is considered a masterpiece among ancient gilt bronze Buddhist icons from the Kanto region due to its sophisticated form. The statue clearly indicates that the Buddhist culture spread across the nation during the period. “In the same way that we learn a lot from other people when we are young, Hakuho was the adolescence of Japanese Buddhist art history. I hope visitors will feel its young and fresh atmosphere from the pieces on display,” said Sakae Naito, director of the museum’s curatorial division.